Usually people are excited about going into January with new goals in place but by the middle of the month, most have moved away from them. I use January as a time of reflection, fasting, and separation from social media to clear my head. After this time I set my goals and resolutions for the new year and I get going to meet and exceed them. Since February is about love, I thought I’d share a special tip each week on how you can “Love Your Selfie” better in 2018. This week’s tips is to simply set S.M.A.R.T. goals and begin the work towards achieving them. Goal setting is simply a measured form of setting a resolution because you will be able to check your progress via timeframes and completed steps as you work towards it. Whether the personal, professional, or spiritual part of your life, there should always be a goal you are working towards. Your goals should be specific, measureable, achievable (attainable), relevant, and time bound (traceable). Remember to express your goals positively and repeat them aloud often. Write them down and hang them somewhere in your home that is part of your daily and frequent line of sight. Furthermore, set precise dates to measure your achievement and celebrate once you’ve completed it. I recently found this on social media and thought I’d share this quick yet fun activity. **Disclaimer: Now, this is only an activity and should only be used as your set goals or resolutions if you deem the statements applicable to where you are or desire to be. ** It is my hope that this little activity makes you laugh, smile, and ignites your passion for accomplishing great things in 2018! Be a little faster than the last one. Be a lot of money to the other side of the world. Be the best option that he enjoys. Be more about our homeschooling. Be a great idea to the other side of the world. Be encouraged by preschoolers watching ABC Mouse and the dialogue. Be sure to see how your day was filled with phenomenal memories. Be safe from dangers seen and heard. Though this activity was meant to be fun I believe I created the perfect combination of achievement possibilities for Team KEMP Academy. I felt so inspired that I decided to appropriately rewrite these (as suggested above) in my planners and adopt them as our resolutions for 2018. I’ve actually already started setting things in motion to ensure we achieve each one. 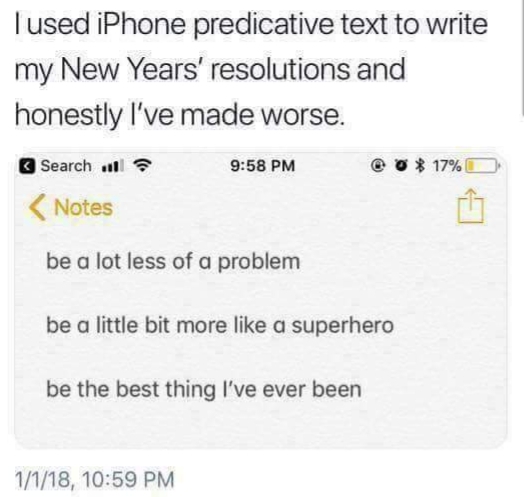 Type those first words and then use predictive text until you have a complete sentence. So, what cute, quirky, or accurate resolutions did you come up with? Be sure to let me know in the comment section below.